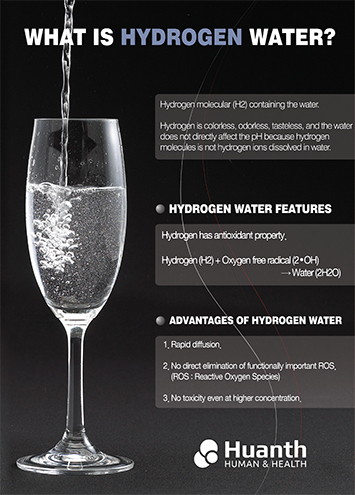 The water that is including a molecular Hydrogen(H2). Hydrogen is tasteless, colorless and odorless. Hydrogen molecule does not affect ph directly because it does not turn to Hydrogen Ion in the water. Molecular Hydrogen is dissolvable approximately 1.6mg per liter in water at normal temperature and 1 atm (Maximum 1.6 ppm). It has a strong antioxidant effect. The rate of diffusion of H₂ in a living body is by far faster than other substances and H₂ easily passes through a cell membrane and reaches the subcellular organelle. It is registered at FDA as food additives and safe. The antioxidant of hydrogen was released in 2007 for papers. Hydrogen and Hydrogen water using research is being conducted and were presented more than 300 papers. Unlike the oxygen, we breathe is an unstable state. Excess oxygen would produced due to environmental pollution and chemicals, UV rays, blood circulation disorders, stress. The overproduction of free radicals cause oxidation in the human body. This causes the cell membrane, DNA, and other cellular structures are being damaged by alteration or loss of functionality. comes into the body through the food source of energy to synthesize ATP. ATP is generated in the mitochondria which are also generates free radicals in the process. Free radicals are destroyed proteins and adversely affects the DNA. In the body a proper position and time, an appropriate amount free radicals are generated, and gives a positive effect. In addition, in our body's defense mechanism the toxicity can be eliminated by free radicals. Most hydrophilic compounds retain at membranes and cannot reach the cytosol, and also most hydropic ones cannot penetrate bio-membranes without specific carriers. In contrast, H2 can rapidly distribute into cytosol and organelles. These results indicate that H2 reach the nucleus and mitochondria and protects them. Free Radicals in a living body remove bacteria and virus and also detoxify a defense mechanism of body when it is generated a proper amount at right time and area. 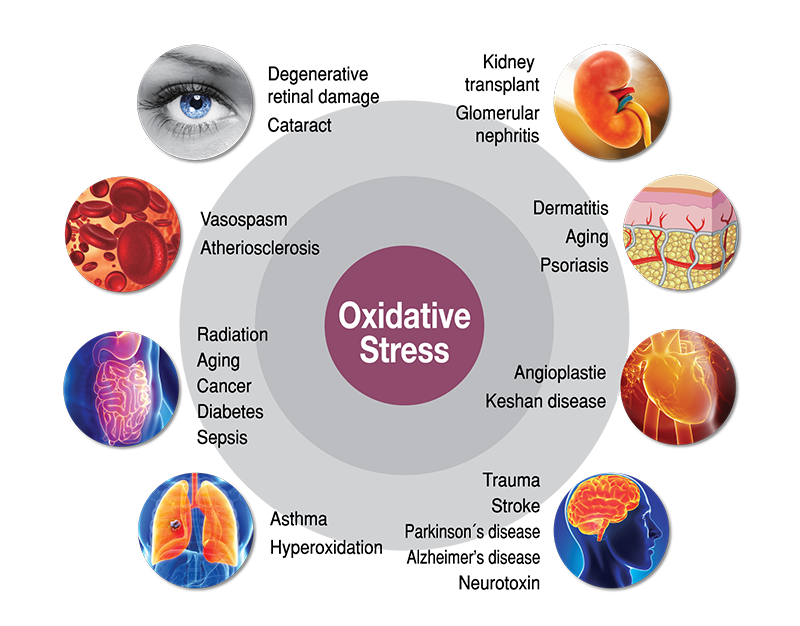 Oxidative stress is accumulated continuously by overproduced Free Radicals, Oxidative stress induces cancer, various lifestyle-related diseases which damage gens of a cell.